Since November, the Presidential Selection Committee has hosted almost 40 forums to engage the campus community in the process of selecting Emory's next president and creating a shared vision for the University's future. When Emory's Presidential Selection Committee began the process of choosing the University's next president, members quickly decided to expand the conversation outward, taking key questions directly to the Emory community. What are the biggest challenges facing Emory's next president? What should Emory do better? What character traits, education or experiences should our next president bring to the job? The answers, they reasoned, would impact the future of the University. It was only right that the community should be part of the discussion. From the moment last fall when President James W. Wagner announced his intent to retire in August 2016, John Morgan, chair of the Emory University Board of Trustees, pledged to keep the community informed throughout the process of selecting the University's next president. In November, just days after the Board of Trustees appointed the 14-member Presidential Selection Committee, Morgan spoke to a joint meeting of the University Senate and Faculty Council. He emphasized that the committee's goal "is not only to identify a presidential candidate to the Board of Trustees, but to consider what we want to accomplish as a community at Emory over the next five to ten years. "This is a once-in-a-decade opportunity to bring together all the voices in the Emory community to determine what we value, where we see ourselves going, and how we define that," said Morgan, who also chairs the Presidential Selection Committee. The committee has hosted 37 intensive listening and dialogue sessions over the past three months to engage faculty, staff, students, alumni, Emory Healthcare physicians, and other members of the Emory community in the selection process. This week, sessions included meetings with faculty and staff. The forum focused on Emory staff was moderated by Presidential Selection Committee members Leah Ward Sears 80L, former Georgia Supreme Court Chief Justice and Emory trustee; Susan Cahoon 68C, an Atlanta lawyer and Emory trustee; and Susan Cruse, Emory's senior vice president for development and alumni relations. The goal was the same as in earlier meetings held with students, individual schools and units, alumni, academic and administrative leadership, faculty, and governance groups. The committee sought to gather a wide and diverse sample of perspectives. "We've had some incredible, thoughtful input from people," Cahoon said at the staff forum. "We're finding it's tremendously useful in thinking about where all of you see this University, what you see as its challenges, where you want it to be, and the kind of leadership you want." At each meeting, the committee has sought opinions about the attributes, credentials, experience, qualities, and values that should be considered in selecting Emory's next president. That input will be used to help inform and shape the presidential prospectus — or job description — that will be pivotal in recruiting potential candidates. 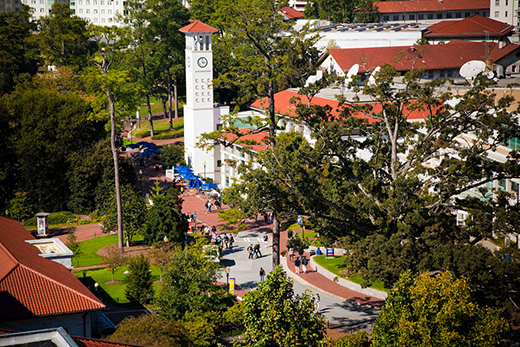 Once completed and approved by the Emory Board of Trustees, the final prospectus will be shared not only with potential candidates, but also with the University community, and it will be posted to the presidential selection website later this month, confirmed Allison Dykes, vice president and secretary of the University, who is supporting the committee with Peter Barnes, vice president for human resources. What do you see as the major challenges and opportunities facing Emory over the likely tenure of the next president? We know that the world of higher education is becoming increasingly competitive. What do you see as Emory's strongest competitive advantage? How would you describe Emory's culture today and how would you like to see it change? What do you think needs to be preserved at Emory and why? By the end of the next president's term, what should be different about Emory? Do you have any advice for the Presidential Selection Committee? At this week's session with Emory staff, conversation topics included college affordability, global competition and international branding, attracting and retaining top faculty, and strengthening Emory's ties with community partners. Dialogue also touched upon Emory's evolving culture, its unique strengths in the liberal arts and healthcare, and the University's willingness to engage with tough topics. The committee was advised to seek a president who was an innovator and risk-taker — a forward-thinking, inspirational visionary who is skilled at building consensus, knowledgeable about development practices, adaptable with the fast-changing environment of higher education, and who has a passion for people. From the beginning of the selection process, public engagement has been identified as a key component, said Dykes. Through listening sessions and online input, valuable information and perspectives have already been collected from hundreds of individuals. "It was an ambitious goal to have a very inclusive process that provided as many opportunities as possible to gather community input," she said. "However, the Presidential Selection Committee placed such a priority on this phase of the search and knew that if we were to have a successful search, having the community engaged in the process was absolutely critical." Throughout it all, "the candor, the thoughtfulness, the desire to contribute — the process has been productive and wonderful," she added. Those who may have been unable to attend a forum and still seek to answer the committee's questions or contribute additional thoughts should visit here. Questions about the process may be submitted here.